A local charity project called Project C is delivering oranges and mandarins to 40 schools across the region that has been hard hit by the manufacturing downturn and the closure of large industrial operations. It is backed by three local businesses in the suburb of Breakwater, Geelong Citrus Packers, Fuso Geelong and Penny Scallan Design, which is part of the Stuck on You group of companies . Geelong Fuso has provided a new 515 Canter with a box body, complete with a dramatic lightning theme paint scheme, for the charity operation. 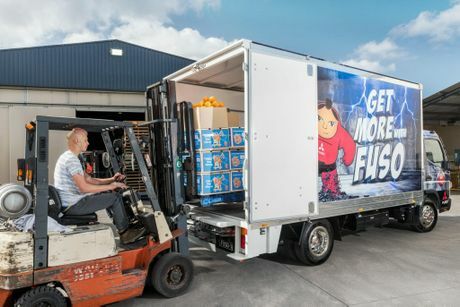 The truck, fitted with the driver-friendly Duonic automated transmission, delivers fresh oranges and mandarins donated by Geelong Citrus Packers, a third generation business that packages between 80 and 120 tonnes of fruit every day. Geelong Citrus Packers takes just 72 hours to move oranges and mandarins from the tree to the retail shelf, so it is well prepared for the logistics of providing fresh fruit to school children. Once Geelong Fuso’s media and marketing coordinator, Allie Crosgrove, phones through the orders to Geelong Citrus Packers’ logistics manager, Calvin Schultink, the truck is loaded with around 40 boxes of mandarins and oranges. He says the efficient 3.0-litre Canter, which can be driven on a car-licence, is perfect for volunteers to drive because they don’t need a truck licence, or experience, to get in behind the wheel. “Really, it isn’t very different to driving a car at all,” he says. Geelong Citrus Packers managing director, David Thierry, says the idea came about from discussions he had with Richard Furnari. Mr Furnari is the dealer principal of Geelong Fuso, the 2013 and 2014 Australian Fuso dealer of the year, which is located just around the corner. The two compared notes and came up with Project C.
Mr Thierry grew up in the citrus business and says the health benefits are clear. “When I grew up I had plenty of access to citrus and I hardly had any ailments,” he says. Mr Thierry says the fast delivery of fruit is important and he feels prolonged storage has become an issue. As a result, the fruit handled by Geelong Citrus Packers varies with the seasons and Navel oranges and mandarins are delivered in winter months and Valencia oranges are delivered in the warmer months. The company removes any loose material or unsuitable oranges, washes and waxes the produce and then packages it, in either bags, boxes or in bulk lots for sale in Australia and a series of international markets including China. Penny Scallan Design, which specialises in premium bags and accessories for kids, not only supports the Project C initiative but has also donated 1000 backpacks, lunchboxes, hats and suitcases to children and schools in the harder hit areas of Geelong.